Science fiction and fantasy are two genres typically associated with white males, but that's slowly changing. Minorities are growing among the ranks of genre writers, and introducing their unique perspective. 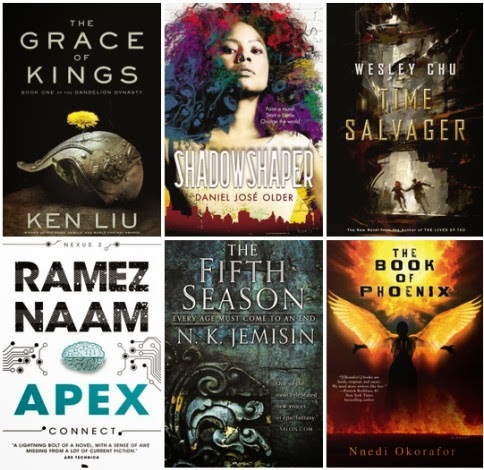 Our Lady of Black Scifi created this list of Science Fiction & Fantasy novels written by writers of color that will be coming out in 2015. While by no means comprehensive, it's a great start. The Grace of Kings by Ken Liu (7th of April, 2015) Two men rebel together against tyranny—and then become rivals—in this first sweeping book of an epic fantasy series from Ken Liu, recipient of Hugo, Nebula, and World Fantasy awards. The Book of Phoenix by Nnedi Okorafor (5th of May, 2015) A prequel to World Fantasy Award-winning novel, Who Fears Death. Phoenix is raised among other genetic experiments in New York’s Tower 7. She is an accelerated woman, only two years old but with the body and mind of an adult, Phoenix’s abilities far exceed those of a normal human. Apex by Ramez Naam (5th of May, 2015) In the concluding volume of the Nexus trilogy, mankind has evolved. They call them the Apex—humanity’s replacement. They’re smarter, faster, better. And infinitely more dangerous. Time Salvager by Wesley Chu (7th of July, 2015) In a future when Earth is a toxic, abandoned world and humanity has spread into the outer solar system to survive, the tightly controlled use of time travel holds the key maintaining a fragile existence among the other planets and their moons. The Fifth Season by N.K. Jemisin (4th of August, 2015) In a world that has suffered frequent, repeated Extinction Level Events for millions of years, and all life (and magic) in this world has adapted to it, Essun must fight to save her daughter at the risk of breaking herself. An Ember in the Ashes by Sabaa Tahir (April 2015) The story of two teenagers fighting to survive under the Empire’s brutal, militaristic regime, which has outlawed reading among the once-powerful Scholar class; the Scholars live under the oppression of the Martials, who silently assassinate insurgents. Lagoon by Nnedi Okorafor (14th of July, 2015) After an alien ambassador’s arrival outside Lagos, Nigeria is leaked via YouTube, it’s up to a famous rapper, a biologist, and a rogue soldier to handle First Contact and prevent mass extinction.